Whenever someone praises The Orville, they almost always point to this episode as the moment they realized the show wasn't "just a comedy," but was attempting to explore deep and dramatic themes that make it a worthy successor to Star Trek. So I've decided to use it as an example of why The Orville is the worst sci-fi show ever. Let's review the third episode, "About a Girl." Look, I get it. You grew up on Star Trek: The Next Generation. You love Star Trek: The Next Generation. That is what Star Trek is to you, and you want there to be more episodes. The Orville feels like Star Trek: The Next Generation, so you want it to succeed. In "About a Girl," the second officer Bortus becomes the focus of the show. He's a member of the single-gender species called the Moclan composed entirely of men. 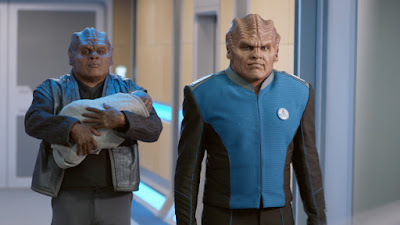 When Bortus gives birth to the first female child in 75 years (allegedly), his mate and the Moclan race are all determined to surgically alter the child to male but are opposed by the Orville's crew. The premise is great and timely and topical. It ignites easy parallels to debates we're having today in religious, scientific, and political fields. Surely, this is the kind of episode the Star Trek: The Next Generation could have tackled. However, the episode does nothing with the premise. Those who sneer that Star Trek: Discovery is too geared towards "Social Justice Warriors" with its female black main character (and they're out there) should be just as contemptuous of The Orville for this episode. The so-called "message" of this episode is a heavy-handed reference to modern gender politics, but it's handled all wrong. There's no subtlety or nuance to the concept. Literally, everyone who isn't a Moclan on the show is on the side of keeping the child female, imagining a universe where there is no diversity of thought. The Moclans' attempts to justify their decision are made with weak and easily disputed arguments, making them into straw men rather than genuine sources of debate. The only attempt to show any kind of sympathy with them are brief (like when Captain Mercer asks if he's wrong to impose his views) and are quickly shut down. Worse than that, the show ruins the story with stupid jokes that undermine the dramatic impact the concept deserved. For example, Bortus is on the side of having the child surgically altered until two crew members get him drunk and show him Rudolph the Red-Nosed Reindeer. The message of the children's movie making him realize how a physical defect can be a benefit so suddenly converts him to the side of keeping his child female that I thought Bortus was just pretending at first. I couldn't believe the show actually expected us to accept it as a genuine plot device until five minutes later when I realized it was really going with it. Star Trek would never have been that stupid. Another example of the poorly developed science fiction on the show is the Moclans themselves. Their planet Moclan is an industrialized wasteland devasted by weapons testing. Clearly, this is a gag on "this is what the world would be like if there were no women," as if women are the only ones who fight for environmental issues and oppose unnecessary weapons. Again, sounds very "SJW" to me. The episode could have gone a thousand different ways with the plot that could have been exciting and interesting. Instead, the show resorted to that beloved (and hated) plot device of Star Trek: the courtroom battle. Yes, that's what The Orville brings to the table: people sitting around tables and arguing. Riveting science fiction. But once again, The Orville drops the ball. The tribunal could have been a real argument for or against conformity. It isn't. Instead of the Moclans genuinely debating for their culture, heritages, biology, and beliefs, the Moclan prosecutor's argument is basically "Girls are weak and dumb." Yet the Orville's defense Kelly Grayson doesn't do that great a job defending her side. She has Alanda mold a titanium cube with her bare hands to show how strong she is. However, that argument is easily dismissed (as I was yelling at the screen) because Alana isn't the same species as the Moclan. They bring helmsman Malloy onto the stand to show how stupid males can be, which (again) doesn't apply because he's not Moclan! Again, the show is using a straw man argument that seems to be reduced to, "Hey, women are cool. They can be strong and smart." Very SJW! But the Moclans were arguing that their entire culture, biology, and even technology had a uniformity that would make females outcasts, and Orville didn't really address that. How exactly would a female fit in? 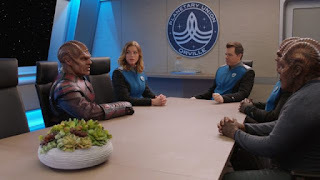 What challenges would she face and how did the Orville (who were fighting to keep her there) plan to overcome those limitations? Also, the Moclans are a different species and there are species on Earth where the females are significantly smaller and weaker than males. For instance, male gorillas are twice as large as females. Since the Orville had never seen a Moclan female, how did they know they were equal to men? What if Moclan females are only two feet tall? What if Moclan females suffer mental handicaps? No, the Orville just assumed Moclan females are equal to men because all males and females in the entire Orville universe have no sexual dimorphism. Not a good way to handle science fiction, and (again) very SJW. There's also another moment where the Moclans make an actually decent argument when they ask about circumcision among humans. Because that might make the story too even-handed, the argument is quickly dismissed. All that was thrown out the window, because there's a deus ex machina at the end, where they discover one of the Moclans' greatest authors was really a woman. However, she actually made the Moclans' point for them because she spent her entire life in hiding, contributing only anonymously. Is that the wonderful life Mercer was fighting for? Hardly a ringing endorsement. But once again, that was shut down because it would make the show too even-handed. I give them props for ending on a down note by not going for the easy ending, but everything else was groan-inducing. Let's imagine this show differently. If this had been an episode of Star Trek: The Next Generation, the Prime Directive would have made it clear that the Moclans' wishes needed to be respected, and the crew would have been duty-bound by the Federation not to interfere. The captain would have been lectured by the Federation about the right of a species to maintain its own culture and not to impose its views. The Orville's attempts to break away and defend the child would have been seen as rebelling against the Federation, turning them into outcasts and threatening to become a renegade ship. Some of the crew would have been on the side of the Moclans, making the ship itself split by the decision. The episode could have turned to action where the Orville gets into a space battle with a Moclan fleet trying to recover the baby. They lose. Let's imagine the tribunal is kept. The Moclan could have brought up medical records that showed their females truly are smaller and weaker than males. They could have argued that the only work on the planet would have been too strenuous for a female, making her unemployable. The Orville could have argued that those same records showed female biology wasn't uniform and women could be stronger. They also could have argued for the existence of little people on Earth who live difficult but fulfilling lives. When the Moclans argued about the females being dumber, Grayson would have searched and discovered the existence of the female author instead of just being handed the truth. In short, decent writers could have made a decent episode. I guess that would have gotten in the way of all the fart jokes. When Bortus asked Grayson for a sample of her culture's greatest work of fiction, I groaned, knowing there would be a lame reference to some pop culture song. Sure enough, The Orville didn't disappoint, showing how they could never give up a stupid gag. Mercer's constant references to his wife's infidelity are already getting tiresome and it's just the third episode. His entire relationship to Grayson is defined by it, and it's annoying. "Let it go," I kept screaming at the TV, "or fire her!" 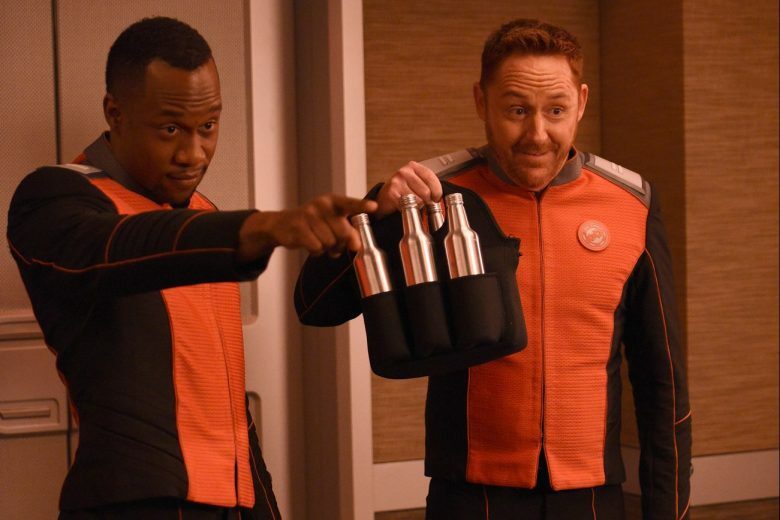 Why does beer in the Orville universe exist entirely in undecorated metal bottles? They don't have beer companies in the future anymore? Or glass bottles? How exactly does high gravity make Alana so strong? She's essentially Superman-levels of strength but without any real muscle tone. Also, if she's strong enough to mold titanium with her bare hands, how is she even able to walk and touch anything without crushing it? What did you think of "About a Girl?"